Our repertoire of travel packs is charmingly handcrafted by the pool of adroit & diligent craftsmen, who have inherited flawless & aesthetic workmanship from their ancestors. 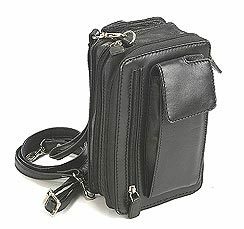 Strong leather made, our travel packs like leather travel pack, leather organizer bags are accessorized by adjustable shoulder strap to hold these packs on shoulder with comfort & style. Durable in quality and comfortable to carry, our travel packs make everyone's journey pleasant and enjoyable. This soft leather organizer bag has been hand crafted from full grain smooth finish leather, with strong stitching and lining. 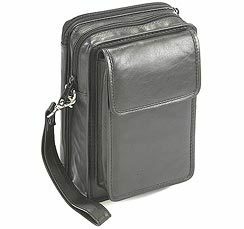 Featuring : 1 fully lined compartment with magnetic snap closure on the front. top zippered main compartment double zippered pocket on the back features 3-drop pockets 9 credit card pockets, 1 pen pocket, 1 windowed id pocket detachable hand strap. "columbus" woven fabric lining inside. YKK zipper and puller. The black travel pack makes a classic appearance in style and function. Made from the finest hand finished full grain soft napa leather with strong stitching and lining. Featuring: 1 fully lined phone or eyeglass compartment with magnetic snap closure 1 full size lined zippered compartment on the front the zippered inside compartment features a large open compartment the rear zippered section features: 2-drop pockets 2 card slide pockets 10 credit card pockets 1 pen pocket, 1 full size slide pocket adjustable detachable shoulder strap. "columbus" woven fabric lining inside.YKK zipper and puller.